Debra Lucero and Rachel Hatch boost downtown Redding. 22 California communities are semi-finalists in the effort to have parts of town identified as "cultural districts." 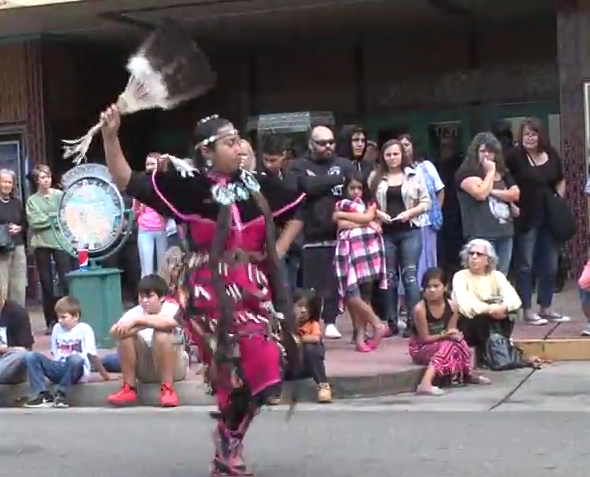 Indigenous People's Day In Redding, 2015. Redding is one of them. A cultural district is an area with a high concentration of cultural resources, and Redding identified several chunks of town on both sides of the river as such a district. Reps from the California Arts Council visited town in early June, and a few steps remain before a decision is made. What are the benefits of cultural district designation? We ask reps from some of the organizations working for the district designation: Debra Lucero from the Shasta Arts Council and Rachel Hatch from the McConnell Foundation. Jim Sharp and Jeff Bellah lead an effort to spruce up Phoenix. Urban renewal is not just for big cities. Even smaller towns have their issues with areas that were once developed badly, or just got blighted over time. Count the city of Phoenix in Jackson County among those smaller towns. The creation of a pair of one-way streets to carry Oregon 99 through the heart of town created an area often called "the hole" by locals. The hole is about to be filled with new buildings and a re-sculpting of the land that is meant to be environmentally sensitive. The skyline of Medford has certainly changed in just a few years. The Higher Education Center, the Lithia Motors headquarters and the coming Jackson County Health Services building are among the structures giving the city a different look. Now the skyline could use some complementary streetscapes, at least in the view of the Metro Medford Downtown Association. MMDA would like to see the formation of an Economic Improvement District to bring in money from property owners to dress up the sidewalks and amenities. We'll be surprised if Jeff Speck drives to the Hult Center in Eugene Wednesday night. Jeff Speck walks us across the street, and across town. Speck is an urban planner who is a big proponent of walkable cities. And he'll be talking about how to make Eugene more walkable in his session at the Hult.